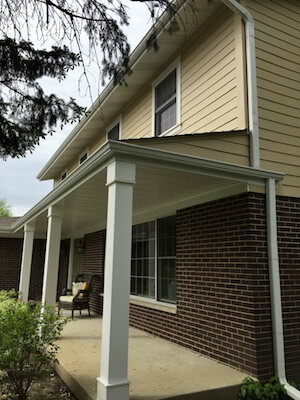 Gutter Contractor in the Wood Dale, Wheaton, Northbrook, IL area. Though often forgotten, a professionally and correctly installed gutter system is a smart investment for any home. In fact, gutters are a major contributor to protecting your home from water damage. Pro Home 1’s team of trained professionals can help you determine the best gutter system to keep your home safe from such damage. If you're interested in new gutters for your home, give us a call today at 1-844-801-2465 or click below to get started! 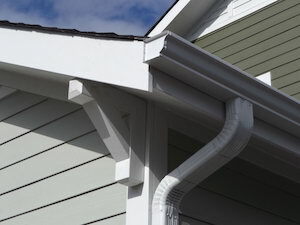 We offer free estimates on all our gutter services in Wood Dale, Schaumburg, Mount Prospect and the surrounding areas. Modern gutters are typically made from aluminum, as aluminum gutters offer a great combination of affordability, durability, and design choice. However, materials such as copper, steel, and even wood are available for gutters as well. These are often used on historical or unique homes. Pro Home 1 offers copper and aluminum gutters. We will work with you to customize a system to fit your needs, including a selection to fit your home’s color scheme and style. From there, we will install it with the same expertise and professionalism that’s made us a leader in the industry. Gutter guards are an increasingly popular addition that provides excellent protection for your home. A gutter cover system prevents your gutters from clogging from leaves and other debris, which means less pressure on you to continually clean out your gutters. Pro Home 1 offers reliable gutter guards so you can save your energy instead of constantly cleaning out your gutters! If you're interested in gutter replacement or gutter installation for your home, the experts at Pro Home 1 are here to help. Our experienced professionals will help you determine the right gutter services and materials for your needs and provide you with a quality repair or installation. Call us today at 1-844-801-2465 or contact us online to get started on your gutter project. We offer free estimates on all our work in Wood Dale, Schaumburg, Mount Prospect, Des Plaines, Arlington Heights, Palatine, Wheaton, Elmhurst, Lombard , Naperville and throughout the surrounding areas.